Rockin' Country, with truck driving and car songs, an Irish Jig, and line dance with a Quebec flavor thrown in. In 1994, J.Kirby recorded his first CD "Riding and Free", composed mostly of original songs. Since that time, the group participated in festivals at Geneva, Montreux, Les Diablerets, Interlaken, Mirande (biggest country festival in Europe), Craponne-sur-Arzon, among others. J.Kirby composed the songs of his second album "Rocky Tequila" recorded in 1997 with his musicians. Fall 2002, the band has released its third CD "Highway To Your Heart", also composed of original songs, most of them written by Kirby or co-written with other artists, and one instrumental composed by the fiddle player of the band, John Intrator. 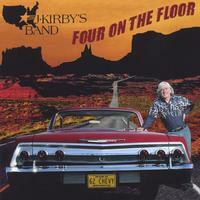 J. Kirby's Band is releasing its new album "Four On The Floor", of mostly original songs, a mix of all the interesting styles you can find in country music.